Following their modestly successful body-swap, teen comedy, 17 Again, director Burr Steers and star Zac Efron reteam for a considerably moodier but just as metaphysically confused saga. The story of a young man emotionally paralyzed after his brother dies in a car accident--torn between nightly games of catch with the boy's ghost and a budding romance--is as scattered as it sounds, though a fine cast makes it go down easily enough. In the battle between raw tear-jerking and understatedly convincing performances, neither side wins, but sporadic sparks fly. Efron's core teen fanbase may well be moved to unburden themselves of tears and dollars in equal measure despite the film's confusions. 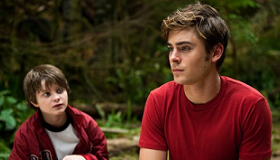 Preternaturally gifted sailor Charlie (Zac Efron) is college bound on a Stanford scholarship when younger brother Sam (Charlie Tahan) dies after a drunk driver hits their car. Five years later Charlie is the graveyard caretaker, which lets him play catch every sundown with his brother's ghost as he once promised. His reputation as a nutjob, plus his stasis, have effectively sealed him off from everyone but fellow cemetery worker Alistair (Augustus Prew), but a chance encounter with Tess Carroll (Amanda Crew) reignites both his romantic urges and his love for sailing. Their budding relationship forces Charlie to contemplate moving on with his life when the movie performs a dramatic first-to-fourth-gear shift, as Charlie goes from occasional conversations with ghosts to full-on supernatural melodrama and romance in twists better left undescribed. The surprises really do surprise but often because they're remarkably stupid and poorly explained. Despite a heavy-handed set-up, director Burr Steers, a long way from his deft comic debut with Igby Goes Down, elicits nimbly understated turns from the luminous Crew and an engaging Efron, out-acting his pectorals by a hair. What could have been a glutinously saccharine relationship between Charlie and Sam is nicely balanced out by Tahan's turn as a frequently sullen, decidedly un-cute kid with a refreshingly foul mouth to rival E.T. 's Elliott. Notwithstanding the contrivances, real sparks fly between the laid-back Crew (she's neither gigglingly RomCom-ish nor sullenly disaffected) and Efron; she uses not-often-heard-in-romance words like, "he flummoxed me" to describe her attraction to him, and you believe her. Class rage also gets a workout, but the focus is mostly on believable, grounded relationships. Sadly, there's no getting around the clunky third act. Even if you're prepared to feel charitable about a sequence of two lovers chasing each other through a fog-covered cemetery set to maudlin singer-songwriter fare, there's no explaining or excusing the finale, which finally brings home the tear-glazed bacon for any patiently waiting teen girls. The supernatural elements, though, aren't really any more coherent or satisfying than in this summer's earlier Jonah Hex, and Steers himself seems bewildered by them; the finale is as incoherent visually as it is tonally. Charlie ultimately has something for everyone, but not enough of any one thing for anyone, except perhaps teenage girls willing to follow Efron through his most ambitious (for better and worse) film yet. Just as the emotions start to seem earned, the film throws it all away. Rating: PG-13 for language including some sexual references, an intense accident scene and some sensuality.